Bank chairman resigns, along with chief executive Andrew Thorburn, after heavy criticism in the royal commission report .. and The Guardians international readership has been informed. Great work from Paul Karp. 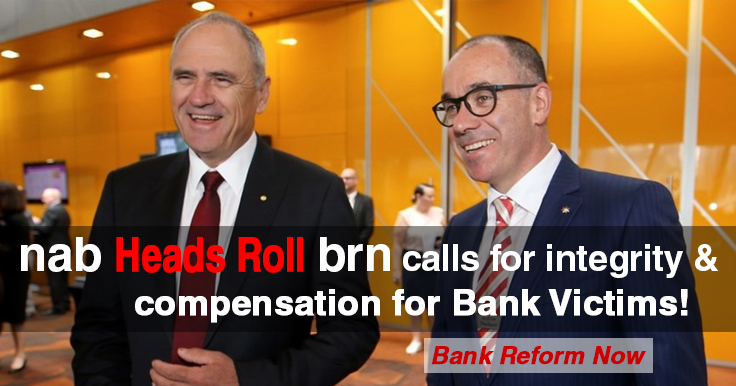 National Australia Bank’s chief executive officer, Andrew Thorburn, and chairman, Ken Henry, have announced they will quit the bank after their leadership was criticised by the royal commission. After a brief share trading suspension on Thursday afternoon, NAB announced the pair’s departure after the market closed. Thorburn acknowledged that the bank had “sustained damage as a result of its past practices and comments in the royal commission’s final report” and recognised the “desire for change”. Henry said he and Thorburn were “deeply sorry” for instances where the bank had “not met customer expectations”. On ABC’s 7.30 Henry offered an even larger mea culpa – that NAB is “a long way” from achieving its aspiration “to do the right thing by every customer every time and everywhere” – but suggested it could achieve the right culture in “a few years”. Thorburn will finish on 28 February and Henry will leave after a new chief executive has been appointed, with Philip Chronican, an NAB director, to serve as acting CEO from 1 March in the interim. Henry said change was necessary and the board should be able to “reset its culture” with a new chair. Bill Shorten responded the departure of the NAB leaders would be “little comfort” to Australians who want “real change to cut the rot out of our banks” rather than “a couple of bankers kissed goodbye with golden handshakes”. The opposition leader declared he will not let Scott Morrison “off the hook”, signalling Labor will continue to demand additional parliamentary sitting weeks to legislate the recommendations of the royal commission before the election, due in May. Although all the big four banks came in for criticism in his final report, the NAB was singled out. The commissioner, Kenneth Hayne, said he was “not as confident as I would wish that the lessons of the past have been learned” by the NAB chief and its chairman. Although Henry insisted the decision was “not made in reaction to any specific event”, in a teleconference after the announcement Thorburn conceded it was those observations by Hayne that had “caused the discussions this week” leading to their resignations. On Tuesday Thorburn had signalled he intended to dig in, saying he was “more determined than ever” to lead the bank, despite Hayne’s criticism. In the teleconference Henry accepted he “could have performed much better in the witness box”. Henry said he did not believe the testimony was the reason for Hayne’s commentary on NAB “although it may have contributed to his view”. Asked about whether other bank chief executives and chairs should follow suit, Henry said he would not comment on the other banks but praised Thorburn for “personally [demonstrating] what senior executive accountability means”. Peter Brandson, of the campaign group Bank Reform Now, welcomed the resignations but said if banks were serious about accountability they had to provide remediation for customers who had been victims of misconduct. In the market announcement, Thorburn defended his performance by saying he had “always sought to act in the best interests of the bank and customers and I know that I have always acted with integrity”. Henry said he was “enormously proud of what the bank has achieved” but “equally disappointed” by instances in which it had failed customers. Chronican said he recognised the “important responsibility in stepping into this role at a difficult time for NAB” and promised its “existing strategy” and self-assessment will ensure it wins back trust and respect. Earlier on Thursday Nathan Rees, the Finance Sector Union national assistant secretary, said Thorburn had announced 6,000 job cuts 15 months ago “so if it’s 6,001 and there’s not going to be any great lamenting of that”. Rees said he had a “different view” of Henry, labelling him “extraordinarily well-credentialed” and criticism of him “unfair”. In a separate announcement, NAB revealed it had made a net profit of $1.7bn in the first quarter of 2019, with cash earnings down 3% compared with the first quarter last year. It said customer remediation programs and regulatory compliance investigations continue to add to costs, although amounts and timing were “uncertain”. 1. Karma – Chairman Ken Henry called for the big four banks to advise then Treasurer Scott Morrison to call the RC . The aim being to handicap the inquiry with weak terms and a short time frame before a more powerful inquiry was called by rogue pollies. 2. CEO Thorburn was not serious in remediating legacy cases. He arranged for Jeff Kennett to protect the bank’s bottom line. Victims chose to pull out before his determination and deal directly with NAB executives. 3. Had Henry and Thorburn been genuine with their intent they would have gone to the RC with a very different attitude and mindset. The board would not have sacked them on the 7th of February. 4. The Hayne RC was a whitewash. It avoided the serious asset stripping that banks and their lawyers profit from. It ignored the decades where politicians and their regulators allowed and enabled financial crimes against all Australians (see BRN analysis - link below). 5. The only way banks can prove they have learnt the required lesson is to compensate victims of crime & misconduct and stop rewarding bankers that have profited from misconduct. Thorburn and Henry should not get a golden handshake from NAB. Henry should be tossed from the other boards he siphons from.